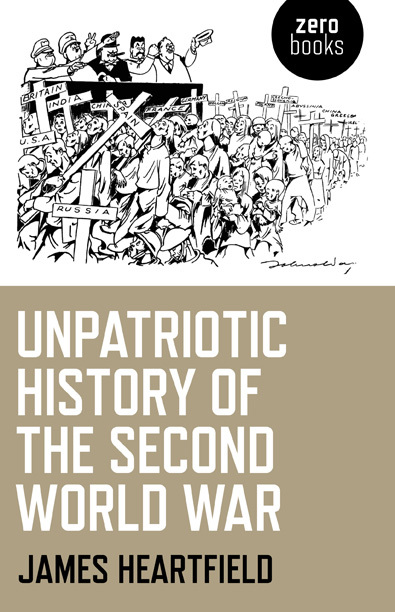 Just received James Heartfield’s An Unpatriotic History of the Second World War, kindly sent to me by Tariq Goddard, novelist and publisher at Zero Books. It’s a really important and unique book and I can’t wait to read and review it. Previous titles in this genre, which I’ve made a special study of, include James Bacque’s Crimes And Mercies: The fate of German civilians under allied occupation, 1944-1950; Sean Longden’s To The Victor The Spoils: D-Day to VE Day, the reality behind the heroism; and Clive Ponting’s 1940 Myth And Reality. All three were insightful and revealing, but only cover aspects of the war. And Ponting’s book is still written by a member of the establishment. This book, however, is absolute dynamite! It’s the kind of book I was looking for when I wanted to carry Charley’s War into WW2. But it didn’t exist. More soon! 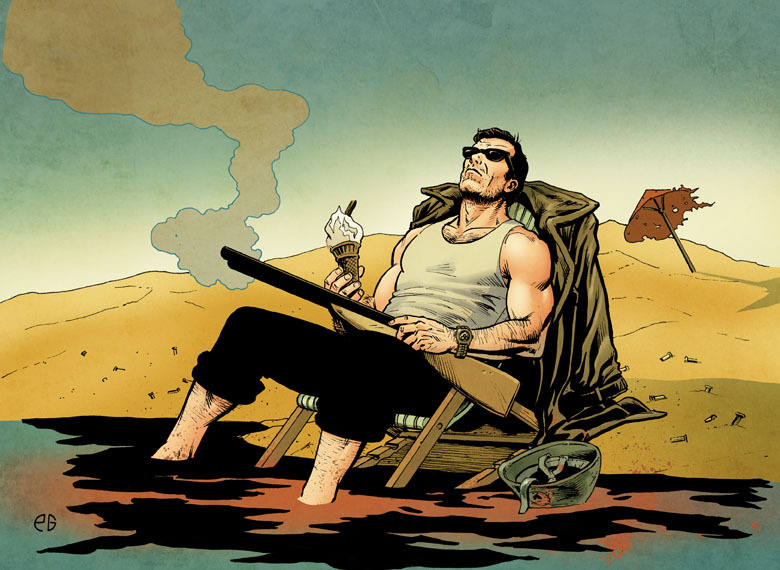 Delighted that Finn is being reprinted in the next Megazine. Jim Elston’s art was fabulous. Finn was very popular – in fact, at the end of his run more popular than Slaine. So i asked the editor at the time, Dave Bishop, if he wanted the character to continue. No, he said without explanation. I never found out why but I’m pretty certain it was because some readers were complaining vehemently about Finn in the letters page being a sinister witch and saying his authentic pagan practises were a bad example to readers. (In a comic with Judge Dredd?! FFS!) The editor actually encouraged some pretty ferocious letters criticising creators – in my opinion because it “cut us down to size”. Bizarre. Anyway, Finn will be in the Megazine soon and you can make up your own mind. But don’t copy him! Or they’ll never reprint the second volume! 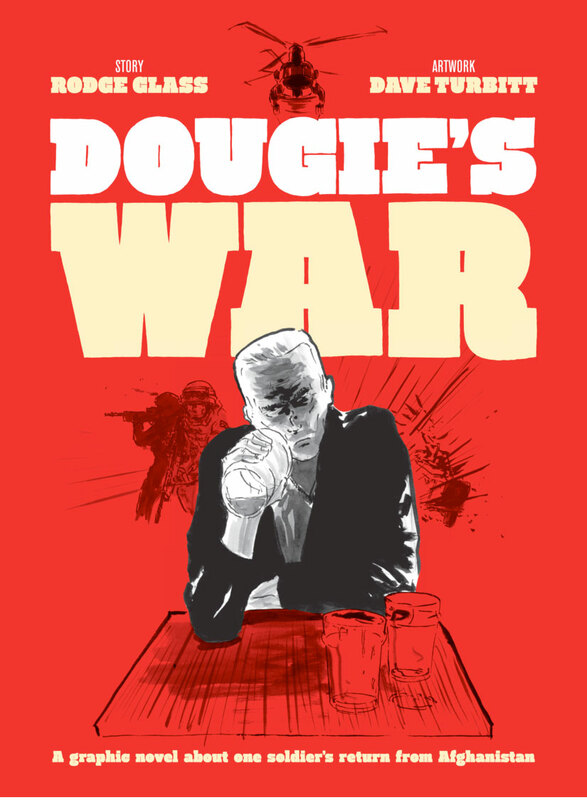 Anyway, back to Dougie’s War: it’s excellent and focuses in particular on post-traumatic stress disorder which is a fact of life for many vets. There’s a section from Charley’s War printed with it, covering the same subject. I’m delighted to recommend it. Too many “War is Hell” films and comics masquerade as anti-war stories. They’re not. E.g. Full Metal Jacket and Apocalypse Now were watched by US soldiers to psyche them up before they invaded Iraq. No-one could read Charley’s War or Dougie’s War and want to invade anyone and that means they’ve done their job. If you’ve come across any friends or relatives with PTSD, this book has particular relevance. There’s a help section at the back with phone numbers. It’s embarrassing to admit that there are no other graphic novels about our modern colonisations of other countries. In comics, we usually stick to science fiction and men in tights. Hopefully Dougie’s War might inspire others to write and draw something on the subject and expose what we’re really doing in the Middle East. 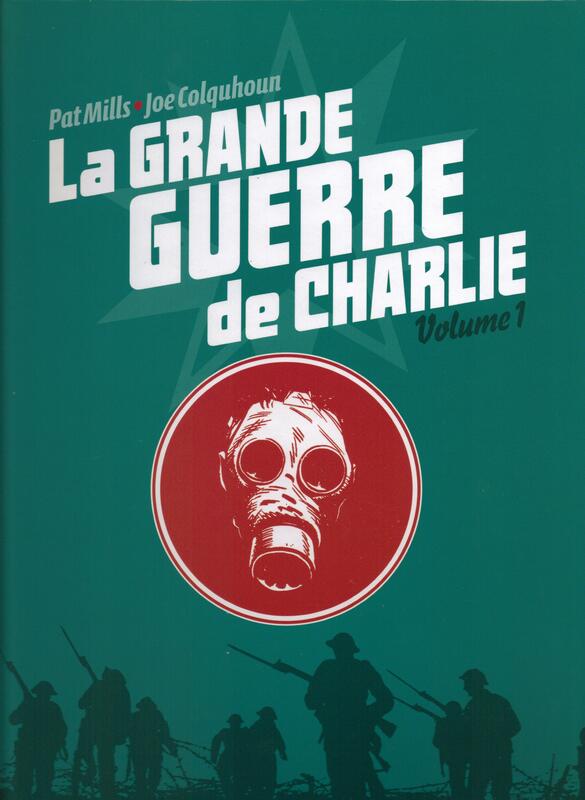 Delighted to learn that Charley’s War French edition is selling very well – better in fact than many successful French fantasy albums and also other British fantasy comic series reprinted in France. This is particularly impressive given that the French comic market has been going through some tough times and CW is a series never originally designed for the French market; thus it’s in black & white with a storytelling style designed for three page episodes rather than a graphic novel. I guess there must be many factors involved in this success – the excellent art, the historical significance for France (even though it’s about a British soldier); its fairly unique anti-war stance; the approaching 100 year anniversary of the start of the Great War and not least the publisher’s great efforts to publicise the book, which have met with an enthusiastic response from the French media and French museums. By comparison, Charley has been published in the UK and it’s only very recently that there’s been similar interest with the series featured at an Imperial War Museum event. I like to think the real reason for Charley’s current success is that it appeals to the ordinary reader in the street who may hardly have read a comic before, but finds the story accessible, informative and about real people whom he cares about. All too often this audience has been neglected in the UK – where no one is interested in reprinting girls comics of similar ilk, despite documentary evidence that there is a gap in the market – and I rather suspect the same is true in France. I think our industry has paid a high price for catering almost exclusively to older male, adult fantasy fans and neglecting the original core readership on which comics used to be based. Congratulations to Laurent Lerner (360 Media Perspective) in partnership with Editions Ca et La for making this happen. Let’s hope we can build on this success in France and in the UK and that publishers in the UK will recognise there is an audience they are missing out on. However, I’m not holding my breath: they do know and they’re not interested. I fear they’re rather like a publicist I once met when I worked at IPC Magazines. I talked about attracting teenage bikers to buy comics, and his response was, “We don’t want to attract those kind of readers.” The same I fear is true today for girls comics and boys comics. No-one actually wants to attract “those kind of readers”, even though we were all “those kind of readers” once. No, stick to the chattering classes and mature fandom – much better for everyone’s elitist egos. I hope CW will continue to grow in France and perhaps herald not a new era, but a revival of a great and populist era. Those “ordinary readers” are the ones I’d very much like to attract back into comics. I thought it would be a good idea to gather some of my Facebook Notes here on my blog, so that non-FB users would be able to read them (it’s also a great way of instantly creating an Archive!). Long term 2000AD readers may have wondered why those early Dan Dares by Bellardinelli and Dave Gibbons have never been reprinted. I can shed a little light on this – it’s because the name ‘Dan Dare’ is owned by another company who own the DD rights. I’ve noticed that the early 2000AD trade paperback collections sell very well and I’m sure Dan Dare would be no exception, so I offered this suggestion to Rebellion: How about if the logo was taken off the story and the name “Dare” deleted in the dialogue. It could be replaced – where necessary – by “Commander” and a title like Space Commander used instead; with a subtitle like “Journey to Jupiter” for the first story. It may or may not be necessary to amend/remove the DD on his chest in those early episodes by Bellardinelli. Obviously some of the later DD’s by Dave Gibbons which featured the Mekon couldn’t be included; but I think it still leaves quite a number of stories and pages. 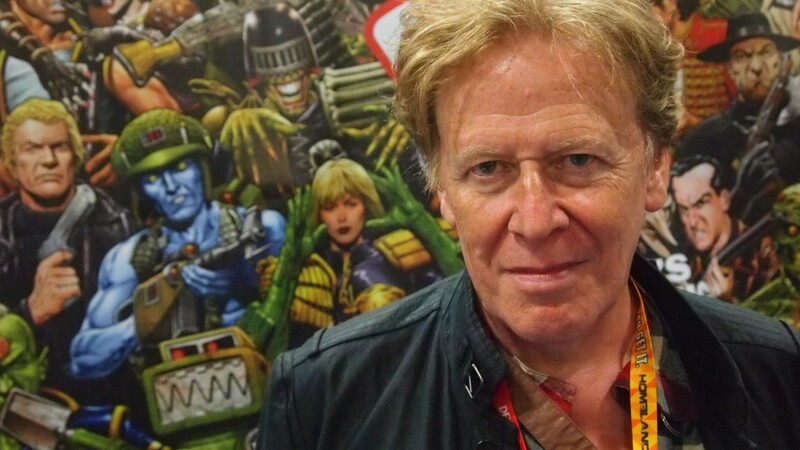 On the plus side, the drawback to those 2000AD DD stories was that they had no connection whatsoever with the original Hampson DD universe and thus could be read as space stories in their own right. Also, I remember they were popular when they first appeared – although never a “number one” story. When I talked to Rebellion, they could see where I was coming from, but I doubt they’ll do anything because it’s uncharted publishing territory and there may be all kinds of drawbacks I haven’t anticipated. And it wouldnt be much fun for the art editor either, ploughing through all those pages and deleting the name ‘Dan’ etc. Anyway, I thought I’d mention it in case anyone felt it would work for them, or they can see a better solution. If so, I’ll be sure to pass your comments onto Rebellion. I guess if there was enough interest they might be persuaded to go for it. Personally, I’d love to see some of those amazing spreads by Bellardinelli again – especially London of the Future where the city has been greened, there are animals grazing near Big Ben and teleport stations have replaced the London Underground.